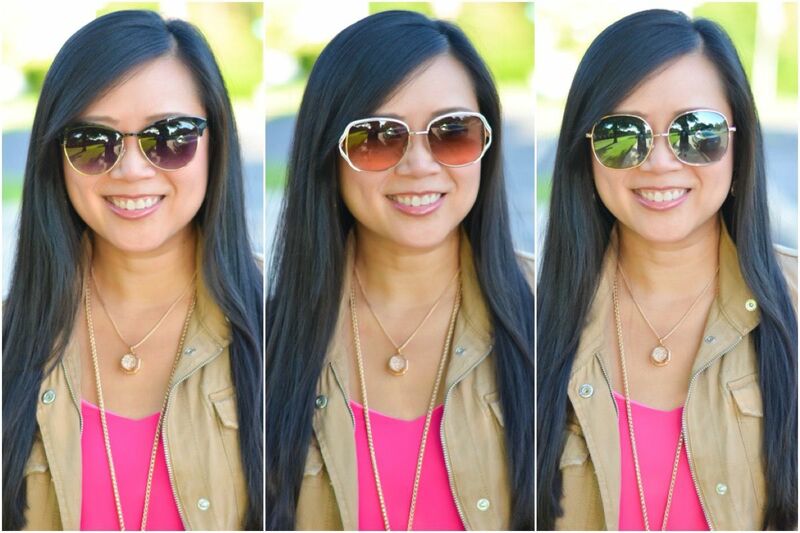 I mentioned in my summer survival post last week that sunglasses are a must for me when I'm at the beach or the pool! I only get one set of eyes in a lifetime, so it's a priority to protect them! I used to pick up all my sunnies at the $5 kiosks at the mall, but since the husband basically collects sunglasses, he has definitely influenced my shopping habits. 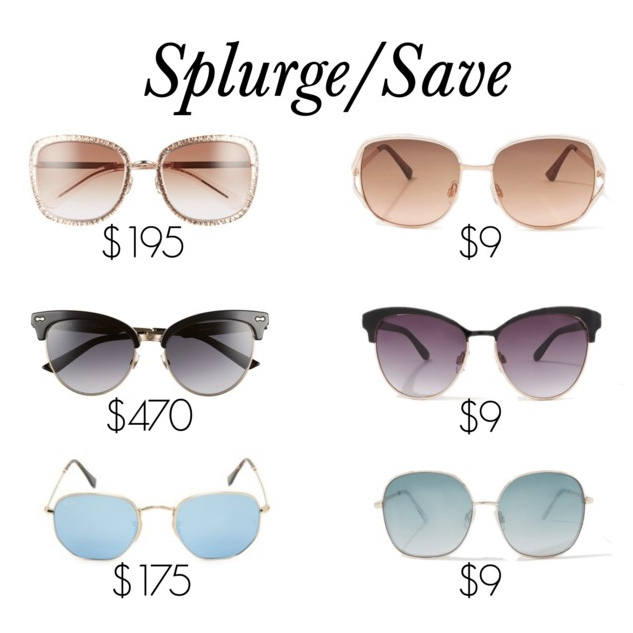 I understand that everyone has different priorities, so I thought I would put together a splurge vs. save comparison so you can see how easy it is to find on trend styles for a fraction of the price. Charming Charlie was nice enough to let me pick a few pairs out to try. Based on the advice, these are the pairs I came up with, and yes, these are subsequently the "save" options shown in the opening graphic. I'd say their advice was pretty spot on and I was pleased with how each pair looked on my face. Going with the ivory frames in the middle option is probably my least favorite combination, but I do also like that they are different than any other pair that I own. And the amber lenses really do sharpen things up from a visibility standpoint! I know sunglasses in outfit photos can be super blogger cliche, but I do love how they can instantly transform the look and your attitude. Plus, let me tell you. When you're wearing sunglasses, it's one less thing you have to worry about (aka your eyes being closed) when picking out suitable photos to post. I do definitely pick my sunglasses for the day based on my outfit and accessories. It's one other piece to help tie your style all together! This was a fun exercise for me. You will have to take this sunglasses "survey" yourself and let me know how their advice matches up with some of your favorite sunglasses in your collection! This is so fun, I love sunglasses. Thankfully I have an oval face so I can rock most shapes. Oooh, such a great guide! The ones you chose all look fab on you!